In response to my earlier post on climate change and aggregate demand, Lance Taylor sends along his recent article “Economic Growth, Income Distribution, and Climate Change,” coauthored with Duncan Foley and Armon Rezai. The article, which was published in Ecological Economics, lays out a structuralist growth model with various additions to represent the effects of climate change and possible responses to it. The bulk of the article works through the formal properties of the model; the last section shows the results of some simulations based on plausible values of the various parmaters. 1 I hadn’t seen the article before, but its conclusions are broadly parallel to my arguments in the previous two posts. It tells a story in which public spending on decarbonization not only avoids the costs and dangers of climate change itself, but leads to higher private output, income and employment – crowding in rather than crowding out. Before you click through, a warning: There’s a lot of math there. We’ve got a short run where output and investment are determined via demand and distribution, a long run where the the investment rate from the short run dynamics is combined with exogenous population growth and endogenous productivity growth to yield a growth path, and an additional climate sector that interacts with the economic variables in various ways. 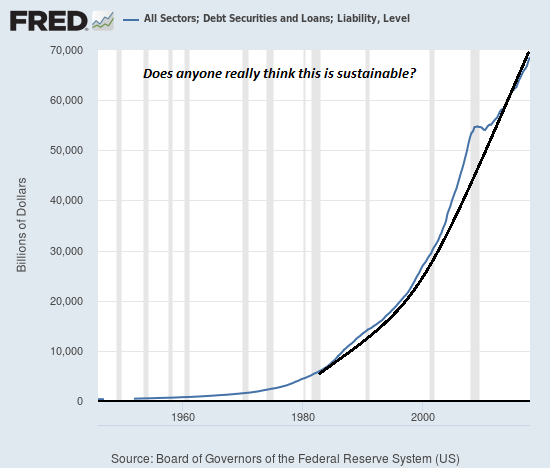 How much the properties of a model like this change your views about the substantive question of climate change and economic growth, will depend on how you feel about exercises like this in general. How much should the fact that that one can write down a model where climate change mitigation more than pays for itself through higher output, change our beliefs about whether this is really the case? For some people (like me) the specifics of the model may be less important that the fact that one of the world’s most important heterodox macroeconomists thinks the conclusion is plausible. At the least, we can say that there is a logically coherent story where climate change mitigation does not crowd out other spending, and that this represents an important segment of heterodox economics and not just an idiosyncratic personal view. If you’re interested, the central conclusions of the calibrated model are shown below. 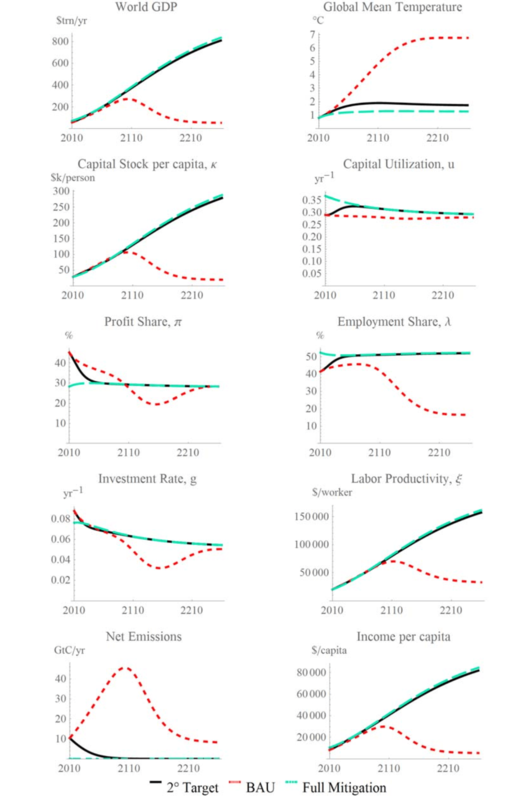 The dotted red line shows the business-as-usual scenario with no public spending on climate change, while the other two lines show scenarios with more or less aggressive public programs to reduce and/or offset carbon emissions. Rapid growth generates high net emissions which translate into rising global mean temperature… As climate damages increase, the profit rate falls. Investment levels are insufficient to maintain aggregate demand and unemployment results. 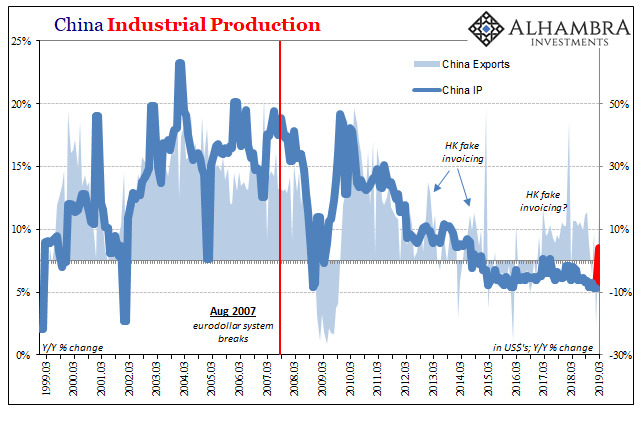 After this boom-bust cycle, output is back to its current level after 200 years but … employment relative to population falls from 40% to 15%. … Those lucky enough to find employment are paid almost three times the current wage rate, but the others have to rely on subsistence income or public transfers. Only in the very long run, as labor productivity falls in response to rampant unemployment, can employment levels recover. In the other scenarios, with a peak of 3-6% of world GDP spent on mitigation, we see continued exponential output growth in line with historical trends. The paper doesn’t make a direct comparison between the mitigation cases and a world where there was no climate change problem to begin with. But the structure of the model at least allows for the possibility that output ends up higher in the former case. This is all very interesting. But again, we might ask how much we learn from this sort of simulation. Certainly it shouldn’t be taken as a prediction! To me there is one clear lesson at least: A simple cost benefit framework is inadequate for thinking about the economic problem of climate change. Spending on decarbonization is not simply a cost. If we want to think seriously about its economic effects, we have to think about demand, investment, distribution and induced technological change. Whether you find this particular formalization convincing, these are the questions to ask. In the jargon, this is a calibrated model. To economists calibration means picking values for model parameters based on what seems reasonable. The alternative to a calibrated model is an estimated one, where the parameters are picked based on statistical tests. It would take quite a bit of work to figure out exactly which of these assumptions is driving the results.